Use the PRO Executive Chef Knife by Napoleon and you will never want to use another knife to prep your meals again. This German steel blade is razor sharp; easily gliding through whatever food you are working with. 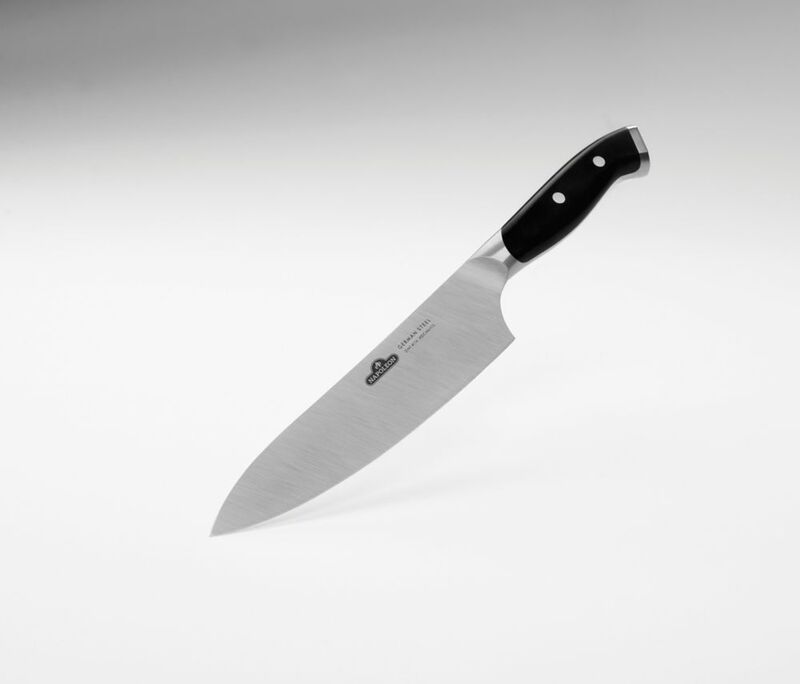 The ideal, all-purpose Professional Chefs Knife will meet all of your cooking needs. The forged stainless steel runs the full length of the knife; the Napoleon PRO Executive Chef Knife is balanced from tip, all the way through the handle. The dual riveted handle provides ergonomic comfort while you slice, chop, dice, and mince. So whether you are a gourmet grill master, or a fanatical foodie, the Professional Chefs Knife is perfect for all of your food prep needs. Cooking in the outdoors is easier when you have the right tools. The 5 piece all-purpose chefs set keeps the most commonly used utensils organized and ready to go all in a convenient carry case. Great for camp, RV, tailgating, and home. Features 7" Spatula with beveled edges for cutting and easy flipping 7" hardened stainless-steel santoku knife Heavy-duty tongs give better control of food while cooking Flat nosed spoon excellent for dishing up meals, great for Dutch ovens Durable carry case easily packs with you Utensils made of stainless-steel and feature ergonomic handles Specifications Stainless steel construction Weight: 2.7 lbs. PRO Executive Chef Knife Use the PRO Executive Chef Knife by Napoleon and you will never want to use another knife to prep your meals again. This German steel blade is razor sharp; easily gliding through whatever food you are working with. The ideal, all-purpose Professional Chefs Knife will meet all of your cooking needs. The forged stainless steel runs the full length of the knife; the Napoleon PRO Executive Chef Knife is balanced from tip, all the way through the handle. The dual riveted handle provides ergonomic comfort while you slice, chop, dice, and mince. So whether you are a gourmet grill master, or a fanatical foodie, the Professional Chefs Knife is perfect for all of your food prep needs. PRO Executive Chef Knife is rated 5.0 out of 5 by 2.